Preheat waffle iron on high. Place thawed tater tots closely together in an even layer on the waffle iron. Close the lid and press it down tightly. Cook until the tater tot waffle is crisp, about 5 – 10 minutes. Remove the waffle from the waffle iron and allow it to cool on a wire rack. 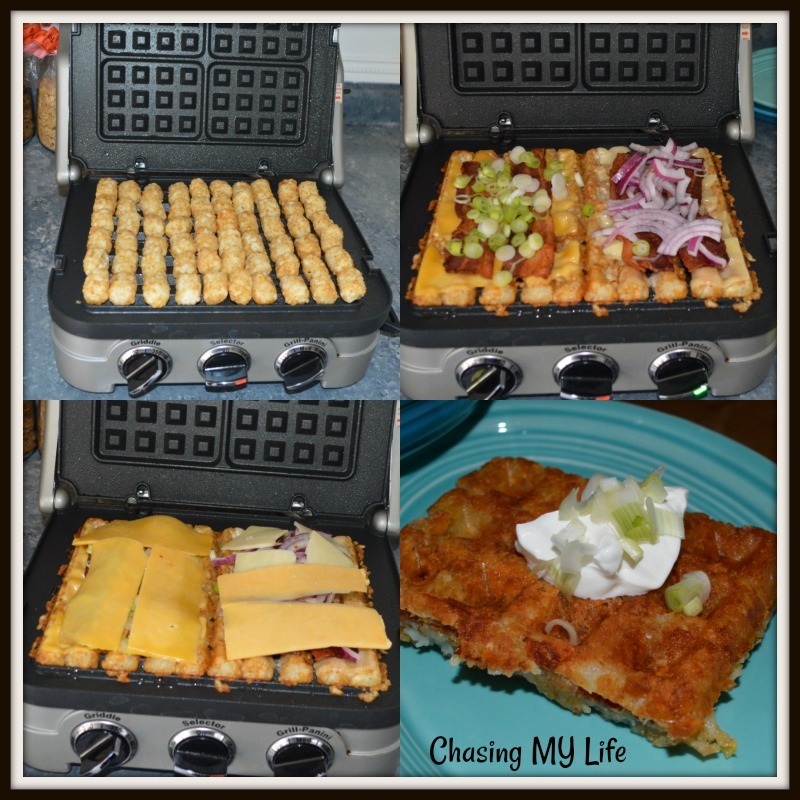 Repeat the process to make a second tater tot waffle. When the second waffle is crisp, top it with half of the cheese, the cooked bacon, and the sliced green onions. Using the bottom plate of the waffle iron, heat the sandwich until the cheese has melted on the bottom waffle. When the cheese has melted, carefully flip the sandwich over and allow the cheese to melt on the other side before removing the sandwich from the iron. Cut it into quarters and serve. SHARING with FOODIE FRIDAY and FULL PLATE THURSDAY. What a great idea and a delicious sandwich! Hope you have a great week and thanks so much for the party! This looks delicious and easy. I hope your recovery is right on schedule.